Worst magazine app I’ve ever used. The sole purpose of download for offline reading is for offline reading. But every time I close the app, it logs off my account and the issues previously downloaded are gone. I was never able to actually read when there’s no internet service. Plus no font size adjustment, let alone night reading mode or other common reading app features. Still awaiting ability to increase text size. Please address this. I have stopped using the app because the default print is too small for me to read and cannot be magnified like prior app versions and other competing news apps. I'm sticking with WSJ app and skipping BW app until fixed. STILL NOT elderly friendly at all. Shame. Shame. Please allow your user to change the size of font. Hides how to end subscription. Boring. Bring back the magazine. App is too plain and boring. Bring back the magazine layout. Where are the interactive videos? Blah!!! Can’t log into my account. Keep telling me request timed out. Still awaiting ability to increase text size. I have stopped using the app because the default print is too small for me to read and cannot be magnified like prior app versions and other competing news apps. I'm sticking with WSJ app and skipping BW app until fixed. STILL NOT elderly friendly at all. Shame. Another redesign of a news app that is targeted for phones and not tablets. Especially in landscape mode. As far as the layout, I certainly don't love it but not sure if I hate it. It leaves me feeling confused as to its overall structure and purpose. There is nothing compelling that draws me back to see what is new. No push notifications. The new design leaves you with the feeling that you have after a 6-hour management meeting; maybe I learned something but feel too blah to say it was helpful. BW provides quick access to a wide range of relevant news that is often missed by other publications. Their web format is convenient. Convenient clarity counts in my busy life! Paper subscriber can’t access digital articles? Bad App, Bad, Bad, Bad! I been been reading Business Week for over 50 years and been reading on my iPad for 5. Don't like the layout and find it difficult to figure out what I have already read. I all so would like a larger font, but is not intuitive as to how or if I can change it to a larger one. I am payed up for an additional year, but may cancel and give up on BW if Bloomberg doesn't improve its app. I almost always read from a down load and have no use for reading an on line version. I have a digital subscription to the magazine that runs through 2019, but the app claims it's expired. Emailed support, which was no help. Called today and they can only refer to their tech team. This went from a wonderful app to a terrible experience - clearly they didn't work enough bugs out before releasing. I'm very disappointed. Have missed a couple issues already, and have no indication when I'll get access back. This revised app is an example of what happens when you give control of an app development to people with no idea what a good product and user experience is. This is neither a good news app nor a good magazine reader. This is an app that is marginal at a lot of things rather than good at one or two. Truly, it's good at nothing. 1 - It crashes constantly. 2 - Sharing a story doesn't actually send a link to the story but a link to download the iPad app. 3 - Highlighting and clipping simply doesn't work. 4 - The layout of the magazine is gone, it's basically a lo-fi offline edition. If you are looking for something that remotely resembles a magazine, get it from the Kindle app or buy it on paper. This app is the pits. I've worked on apps like this in companies like BW before. To the people who work at Businessweek who objected to this app, you were right. It cannot find my subscription, and tells me that it's expired when it still has two years to run. To make matters worse, it has removed all my previous, paid for, downloaded back issues. The digital people sent me to the subscription people who verified my active subscription, and are now sending me back to the "digital department." A bunch of incompetents, IMO. At least the dead tree edition gets to my mailbox, so far. Plus, the new format isn't user-friendly. I liked the older, magazine-like version. Of course, I'm only allowed to look at four articles online, because my subscription is out there in the ether. Thumbs down on this dreck. Though I am a subscriber I cannot access the current issue. Customer support is of no help. What I get is a poorly organized screen of a few articles. Bring back the old app. It was far superior. All my downloaded magazines must be re-downloaded. 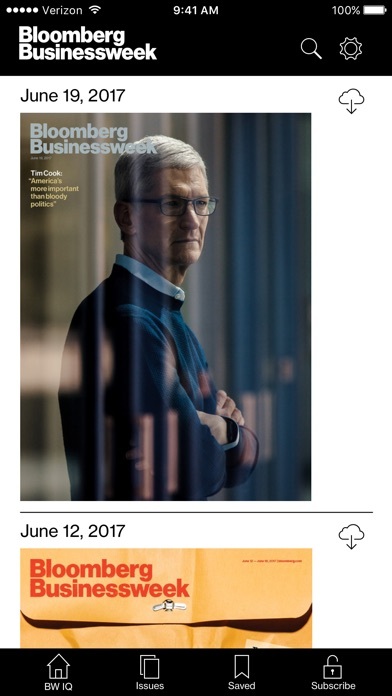 I ordered out of the Apple App Store so don't have needed information to re-subscribe. How stupid are the people that designed this app and how stupid is Bloomberg for not reviewing what was being developed in their name. I guess I'll have to suspend my subscription and get my news from Fox. I'm writing this review on 6/27/2017. This is my THIRD negative review. BW has done the worst of worst. Now I can NOT even use my iPad to read my subscription! This is the "new" app that is black faced with the large B and W. No matter with what method I sign in, the app says my subscription has expired :( I can't believe this kind of garbage is allowed into the app store by a reputable organization. This following two reviews were written in 7/2016 and 3/2017: When I started to use the app years ago it was delightful. But the quality of the app (not the magazine) has being going downhill steadily. Now I can't even download the latest issue (July 4, 2016). The download bar is stuck at 99% percent. It's consistent after restarting the app. Seems the app needs a better engineering team! At the current version on 3/28/2017, the app just gives me a totally dark screen on my iPad Pro . This is outrageous. I have tried 6 times to download the June 12th issue but it always stops loading at 99%. Other older issues did load. To make matters worse, your support link page on the Apple Store website is not found!!!! One of the best magazines publishing now has an app to match. Might be better for phone but iPad experience is ruined. EDIT: It gets worse; can't even send feedback through the app because I don't use the iOS Mail app. I will not resubscribe. I am a subscriber and verification fails. Suppprt non-existent. Messed with Perfection. Now POS. Updated BW app won't validate my account saying it's expired despite expiry is in 2 years. Why publish before testing BW? Will miss content while traveling. If Donald Trump was president of Bloomberg or MAZ a ton of folks would be looking for new jobs today. I had the unfortunate luck of subscribing to BusinessWeek one week before this redesign. So far it is horrible. I'm unable to view more than four articles since the app won't react to my subscriber information. Seems like everyone is having this problem. Bloomberg needs to fire MAZ for releasing something that hasn't been tested. Why did they change the best designed and functioning digital magazine app? Why ruin an easy to read and use format I've used and went to it frequently - an excellent compliment to my paper subscription? With this new update I cannot link my paper subscription which it says it's expired (its active until 02/2018). And lost all my past downloaded issues. The older version was perfect for reading and the layout was fantastic and could be done offline. This is a terrible change for a media company. 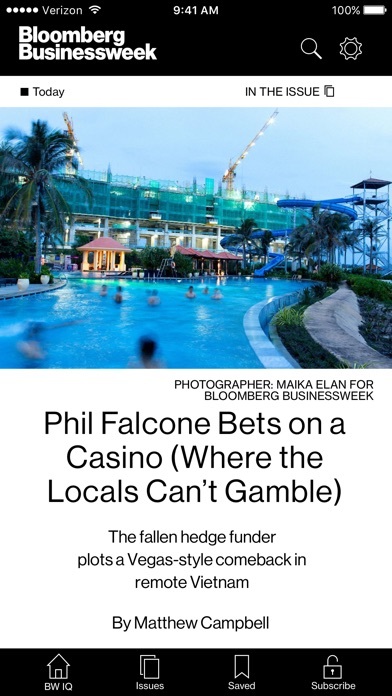 The new Businessweek app is trash. Issues I noticed the first time I used the new version: The subscription login data doesn't carryover to new version There are about 5 layers of data needed to even login. As a paper subscriber it was very difficult to provide the various credentials required to even get access to the issues. Many articles in the issues I previously downloaded to be available offline simply aren't visible without wifi. On iPad in landscape mode the text still presents itself as if it were in portrait mode. It is extremely difficult to navigate the new layout and figure out what articles are located where. Advice: your old version was great. I know the supply for developers is thin, so either go back to the old version or hire some competent developers instead of bums off the street. Terrible update that takes a huge step back from previous versions (can I have the 2012 version back?). Old app felt like reading a digital version of the print magazine and was easy to view downloaded issues at a glance. New one feels like scrolling through a poorly designed website, and makes viewing downloaded issues very labor intensive (e.g. Full size screen shots mean an entire page scroll per issue). Don't update if you can avoid it. Very interesting. Info I would never have learned w/o your article because it is non-intuitive and outside my zone of life. Well written. Thank you. I would encourage more coverage of the reality of immigration, because it is poorly covered by traditional media and is a hidden political leverage point. And the truth is that America either wants this activity protected or wants it suppressed. That is insight you could develop and feed the survey conclusions back to the reader. I leave it in your capable hands! Thanks again. 60/40. Won't work no matter what I do. I've entered my credit card information about 10 times now. I get the magazine by USMail. it has been at least a year since the online version changed!!?! Since then I am unable to understand the instructions by those operating the online service. I am not ignorant of the fact I don’t understand the gibberish instructions. I use iOS and whoever designed the current system has used some thing not resembling, remotely,what I need to download to get access to the Internet version. Sorry ! 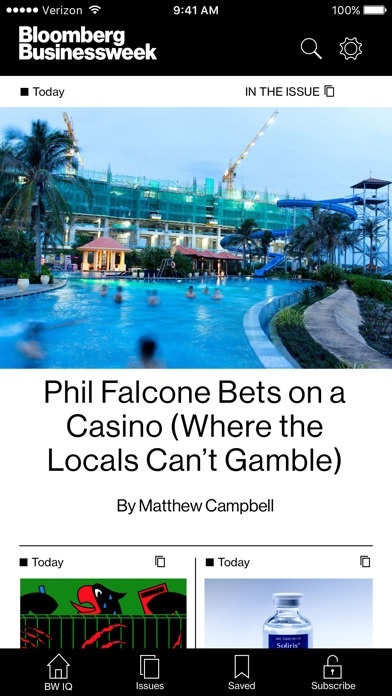 I tried to link this app to my long-standing Bloomberg Businessweek print subscription. It never gets beyond the first screen, I press the type of subscription I have, and NOTHING happens. I’m just stuck on that screen. So now I can’t link. Non-linked app looks to be unusable since all I’d get is a few articles per month, and possibly have to pay extra for that too. I uninstalled immediately. If I am charged anything, I will repost here. I’d advise DON’T DOWNLOAD BLOOMBERG APP. Can’t create account. API connection error! Please bring back the old layout. The new layout is difficult navigate and many smaller news articles you would see and read on various pages seem to no longer be available, only the major headlines. Notify us all when there are changes to make this more readable. The entire UX design team should be fired after this release of a new redesign! Simply pathetic. No ability to increase the text size. Would like the magazine to open where I left off. Takes to long to start. Suggestion: make the app more usable. Very simplistic and not very modern compared to,other leading magazine apps. Can't email article to someone else without them having the app. That's makes no sense for marketing purposes. Stuck in the past. First update since they decided to partner with MAZ for no frills old school tech. Can’t believe there is still no way to choose font size. Really Bloomberg? One size fits all is your choice. Maybe read a few of your own articles on the trend of personalization. They make it hard to cancel subscription. There is no way to do this online. When you call their customer number they ask you to cancel using iTunes. But iTunes doesn't save their subscription. Bring back the old version PLEASE!!!! The new format is simply horrendous in comparison to the previous app. The previous design was one of the best digital news magazines available. It was a pleasure to read and navigate. The design aesthetic and content was stellar. What could have persuaded anyone to migrate to this platform as an improvement is beyond my understanding? It clearly didn't go through any A/B testing...PLEASE bring back the old and more modern app design asap!!!! Major major step backwards from the great previous app. Phone version is good, but the iPad version is completely ruined, all articles are mostly white space on the screen. Do yourself a favor and just download a PDF copy of the print edition. Navigation is terrible. Old app was very useful. Why change? On my iPad, the download button is missing for the latest issue. So far, I've also needed to re-install the app for each new issue on account of log-in problems. I wish they'd bring back the previous app design, which was easier to navigate and much less buggy. And the editor of the magazine if he ever checks this app. What a joke. So unfriendly from a UX point. Shameful really. Articles are difficult to read and you user experience is worse. I stopped reading business week after this app was released. Bring back the old one please. This one is glitchy, dull, and leaves large amounts of unused space on your iPad screen. The old one worked beautifully on your iPad and was well-formatted and colorful almost like a real magazine on your screen. They should kill this version immediately and go back to the old one. I used to be a loyal reader of the magazine in the apps previous version. Now the app takes forever to load, is buggy and doesn't reflect the articles of the magazine. Unless they significantly overhaul the app I won't be renewing my subscription. Today my subscription vanished from the app. I'm still receiving physical issues in the mail, so I tried to activate my account number in the app only to be told that I'm already logged in. What? Then why is it saying I need to subscribe when my sub doesn't expire until August 2018? I have this app specifically to read on flights. However after the latest update, even though I had multiple issues downloaded for offline reading, it would not load unless I was connected to the internet, making it useless on my flight. Great magazine and reporting. However app does not allow adjustment of font size. Only equivalent to font size 10 is available which making reading extremely difficult even on large iPads. Recommend Wall Street Journal or Fortune as examples of how to do a reading app right. BW in previous years was about business and relatively neutral. Now it appears overtly partisan. Expect me not to renew. Top touch journalism. Truthful and real. I can believe what they write. Ability to reach downloaded content when offline would be highly useful. This magazine is like a real easy study guide and great learning of not just financial matters but all types of topics! The new MAZ-based app is a huge step in the wrong direction. Navigation is clumsy, the layout is unattractive and boring, and using the sharing menu with Notes and other apps gives you a link to the app in the App Store, not to the article you’re reading. I would go back to the previous app in a heartbeat if you make it available. Come on. This is not 2005. Make the font size adjustable so those over 42 can read! This App is so bad that I’m considering canceling my BW subscription. I’ve tried to use this apps several times over the last year. Each time something doesn’t work. The first time it couldn’t verify my address even though it was identical to the label. Their support was useless. The second time a year later (I thought let’s give this a try) the menu option wouldn’t let me select that I’m a print subscriber in the US. It just ignored my clicks. Is there zero quality assurance that happens at BW with this vendor MAZ? Great way to frustrate your loyal subscribers Business Week. Love this pub and have been a loyal subscriber for years to print. I switch to digital, pay $450 and cannot login to any digital devices iPad / iPhone etc. I literally spend 4 hours on 5 phone calls and they tell me they cannot do anything for me and I need to contact their tech team who can only be reached via email!!! What are you serious. I do this multiple times and they send me a link to reset my PW!!! I can do that myself and of course it doesn’t work so let me talk to someone who knows what they are doing! What’s more, at one point on the phone one manager transfers me to another and I ask very politely why are you transferring me after I just spoke with you for 15 minutes and now need to start over with someone else —- she simply says, “Well....ummm....Just because. That’s why.” Learn how to manage a call center. That can’t be on an IVA script. Net net I paid 450 on 11/27 and cannot access digital and there is literally no one at this 22.5 Billion dollar company that can troubleshoot this? Criminal. Bloomberg Intelligence Network is second to none in planetary business infrastructure data analytics and the news reporting that results from that is phenomenal. The Business Week, broad spectrum, geopolitical, micro and macro economics, based news stories are without parallel. Sadly, it has become Left Wing, elitist in its bias and has embraced “mathematically unsubstantiated man made global warming” as a truism. Regardless, it is a marvel of a news source. If you are a individual investor looking for double digit returns on your investments it is a must and interesting weekly read.